Solitaire Games of Skill is a software program that allows players to win solitaire card games more often and with less effort. With Solitaire Games of Skill, solitaire is played with less scanning of the layout because critical cards are marked with colored strips. Also solitaire is played with up to 75% less mouse movement and mouse clicks. Unwinnable games for many difficult games are thrown out thereby making the games more winnable and more fun to play. 354 of Solitaire Games of Skill's 756 games are original games not found elsewhere. Many of these original games add an element of skill to already popular games. Solitaire Games of Skill can list games according to type instead of alphabetically. This allows the player to find games similar to the ones he likes. A listing of the features of Solitaire Games of Skill not found in other solitaire software programs is given below. 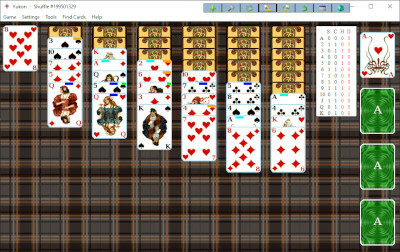 SOLITAIRE GAMES OF SKILL IS A SOFTWARE PROGRAM THAT ALLOWS SOLITAIRE TO BE PLAYED WITH LESS SCANNING OF THE LAYOUT BECAUSE CRITICAL CARDS ARE MARKED WITH COLORED STRIPS. Cards throughout the layout that can be moved are marked with blue or light blue as seen in the Yukon and Canfield screenshots below. Light blue cards go on foundations while dark blue cards can be built on the tableau. Cards are not marked for easy games since marking cards would make the games too easy to win. Cards that can be used to uncover facedown cards or create spaces are marked with brown as seen in the Yukon screenshot below. The three of hearts, three of diamonds, jack of hearts, four of clubs, and queen of hearts are all marked with brown in their upper right corners. Cards that if not separated will cause the game to be lost are marked with green. 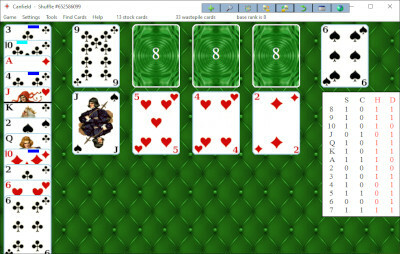 The nine of hearts and seven of spades are marked with green in the Yukon screenshot. In a game like Spider, the player is notified when it might be possible to remove a complete suit sequence. If you are having trouble finding a card in a complex layout, you can mark the card with yellow. Based on cards visible to the player, tables list counts of hidden cards by rank and suit or color. SOLITAIRE GAMES OF SKILL ALLOWS SOLITAIRE TO BE PLAYED WITH UP TO 75% LESS MOUSE MOVEMENT AND MOUSE CLICKS. Right clicking on the layout anywhere there is not a card will deal cards instead of having to click on the cards themselves. A card can be sent to a particular point in the layout by simply clicking at that point rather than having to click on the card itself. If more than one card can be built at that point, the best card is chosen. If several cards contained in separate cells form a sequence that can be moved to the point, all of the cards are moved to the point with a single click. For games with rules requiring that cards can only moved one card at a time, sequences of cards can be moved with a single click, if the same movement could be accomplished legally with several clicks using spaces, empty cells, and intermediate card builds on other columns. Other solitaire software will move cards based on spaces and empty cells but not take into account intermediate card builds on other columns. Furthermore other solitaire software will only move cards in this fashion for FreeCell and perhaps a few other games. Card columns can be swapped by just dragging one column over the other and letting go the dragged column, if the same result could be accomplished using a series of legal moves. This feature is handy for games like Spider and Beleaguered Castle where tableau building is by rank only, but there is an advantage to having suit sequences. Clicking once at the top of a column of cards can send the entire column to the foundations. For games like Canfield and Klondike where cards are dealt three at a time with unlimited redeals, every third hand card is visible at the same time in a column. For example the Canfield hand cards in the Canfield screen shot seen below are along the left margin. Only every third card is visible. The other hand cards are hidden below the third hand cards and are not available. Thus the player does not have to click through the deck each time to reach a card or see if a card is available. In the screen shot the thick horizontal bar above the queen of spades represents the prior location of the top edge of a card that was moved to the tableau or a foundation. Cards above the line cannot be accessed until the deck is redealt by clicking above the thick line. This mirrors the fact that when dealing cards to a single pile, you cannot reach cards not directly underneath the last card dealt except by redealing the deck. Games like Flower Garden and Northwest Territory have several reserve cards that are simultaneously visible and available for play. The reserve cards are sorted by rank and suit. Thus the player does not have to scan through a long list of reserve cards to find a desired card. If a game has unlimited redeals like Unlimited or Big Forty, all the hand cards spread out so that all the cards are simultaneously visible and available for play. The hand cards are also sorted by rank and suit. Thus the player does not have to cycle through the deck or scan through a long list to get to a desired card. If a game becomes unwinnable during the course of play, often the game is stopped even if many more moves are possible. Also if during the course of play, it becomes obvious that the game is won, the game is finished automatically for the player, saving the player from having to make several perfunctory moves to finish the game. SOLITAIRE GAMES OF SKILL THROWS OUT UNWINNABLE GAMES, ALLOWING MANY GAMES TO HAVE HIGHER THAN NORMAL WIN RATES. Games that are frustrating to play because of low win rates become fun to play. Thus Russian Solitaire whose normal win rate is 5% can be won 25% of the time. Similarly Flower Garden with a 20% win rate can be won 60% of the time. Chameleon's 2% win rate goes up to 45%. ALMOST HALF OF THE GAMES IN SOLITAIRE GAMES OF SKILL ARE ORIGINAL GAMES NOT FOUND ELSEWHERE. Raise your solitaire playing experience to a higher level by playing Monster Spider. Monster Spider is Spider played with four decks and has about the same win rate as Spider. Because Monster Spider is twice the size of Spider, it has twice the complexity requiring players to play with with a higher level of skill in order to win. Because all moves are indicated by colored strips on the cards, the layout does not overwhelm the player. There are also challenging four deck versions of Crescent, Buffalo Bill, FreeCell, and Miss Milligan which will require you to up your game. These games are not like the easy to win four deck games usually found in solitaire game collections. Checkered Yukon is a hybrid of Spider and Yukon which can be won about half the time partly due to unwinnable games being thrown out and bad card sequences being flagged. The standard Yukon Spider game is notoriously difficult to win. Phantom FreeCell is a version of FreeCell where about half the cards are facedown providing a tantalizing uncertainty to the game. Mountain is a version of Klondike where there are no facedown cards allowing greater opportunity for skill. This very winnable game has one redeal. Little Miss Milligan is a one deck version of Miss Milligan which is just as exciting but less exhausting. Nestor's Room is a version of Nestor which allows cards to be moved to a cell thereby greatly increasing the skill level and the game's winnability. If you are winning your favorite game too often or not often enough, you might find a pleasing alternative here. Many original games are more challenging versions of easy games or easier versions of more challenging games. SOLITAIRE GAMES OF SKILL HAS A UNIQUE APPEARANCE. In part because of the judicious placing of the toolbar in Solitaire Games of Skill, the entire layout of all games is immediately visible to the player. No scrolling is needed to see any of the cards at any time. Listing humdreds of games alphabetically can be overwhelming to the player. In Solitaire Games of Skill games can be listed by game type as in the middle screen shot above. If you like a certain game, this type of listing will make it easy to find similar games. In either the alphabetical or game type format games can be listed by the number of decks they use, skill level of the game, or the degree of difficulty of the game. Solitaire is played with large images of luxury cardsets as seen in the pictures at the top of this page. Solitaire Games of Skill saves the solitare player a lot of time and effort when playing solitaire games. Unwinnable games are done away with saving still more time and effort. With critical cards marked the player can see the big picture and can formulate a better and more comprehensive strategy for winning the game. Out of hundreds of original games, the experienced solitaire player can find original solitaire games which are similar to their favorite games and in some cases perhaps more fun to play. To experience Solitaire Games of Skill, click on the left box below for a free Demo of the Solitaire Games of Skill Collection. The Demo differs from the Regular version of Solitaire Games of Skill in that it has only 5 ways to shuffle a deck of cards while the Regular version has over two billion different shuffles. Thus each game in the Demo has only 5 different layouts. However the Demo shuffles are from 616 to 620 using the Microsoft FreeCell game number system and therefore include the notorious FreeCell game number 617 (see Mike Keller's website). The Demo version has the same number of different games as the Regular version. But the Demo version can only be used to play up to 40 games while the Regular version of Solitaire Games of Skill has no such limitation.